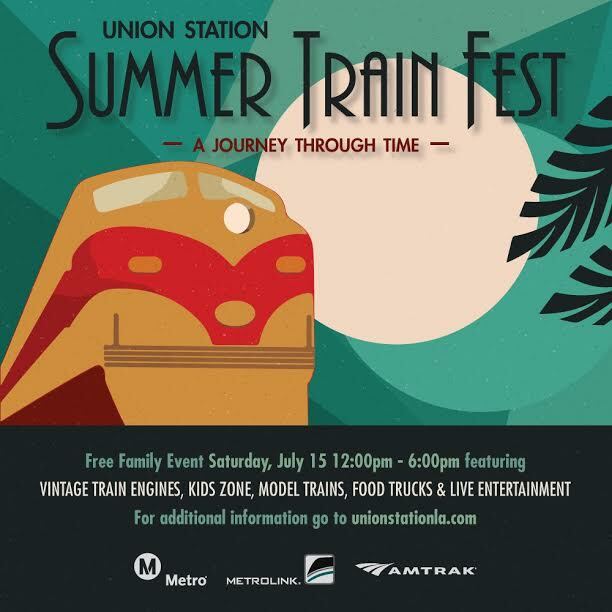 Take a nostalgic journey through time at Union Station’s Summer Train Fest, a free family event at LA’s iconic downtown venue featuring a rare collection of beautifully restored vintage train engines and cars from the 1940s, 50s and 60s. Overland Trail: 1949 Club Lounge train w/ passenger lounge, bar and barbershop. Pacific Trail: 1950 fully restored passenger car w/44 seats. Tioga Pass: 1959 Business car w/ lounge, sleeping quarters, dining room and kitchen. National Forum, Pullman Car: 1956 sleeper car from the Pacific Railroad Society Inc.
Tickets will be available to tour the inside of the Santa Fe 3751 Steam Locomotive. Ticket prices are $20 for adults, $10 for Children (5 to 18 years of age). Children under age 5 are free. Train enthusiast can enjoy a variety of model trains and special tutorials from the Los Angeles Model Railroad Society and Pasadena Model Railroad Club, along with a Kids’ Zone from Griffith Park Travel Town and tunes from award-winning harmonicist Ross Garren. The stations South Patio will come alive with L.A.’s premier food trucks and music from the city’s hottest DJs. Local vendors including Skylight Books, Train Shack and California Operation Lifesaver will offer model train supplies, train-themed merchandise, and train-safety education and awareness throughout the event. Union Stations Summer Train Fest is hosted by Metro in partnership with Metrolink and Amtrak. Visit Eventbrite to register for the free event. For additional information, visit www.unionstationla.com or Facebook.